← What’s in a Wrapper? I had a rare weekend with no clay assignments so I decided to do a little playing. We cherish our butterflies and humming birds in our neighborhood, planting plants specifically for their needs. The Monarchs and Western Tiger Swallowtails are our favorites of the butterflies, with many people counting their caterpillars daily. I have a particular fennel plant that the Swallowtails come to every years (and my parsley this year also). My other friends have numerous milkweed plants for their Monarchs. 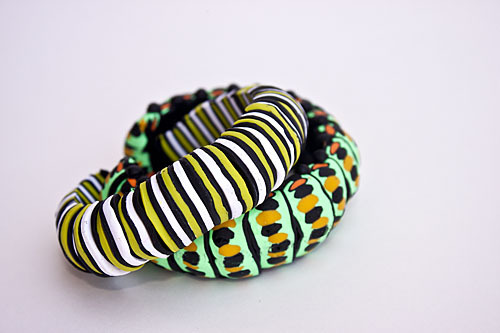 So we were looking at their “fatties” one Friday evening and I said, I could make a bracelet like that. 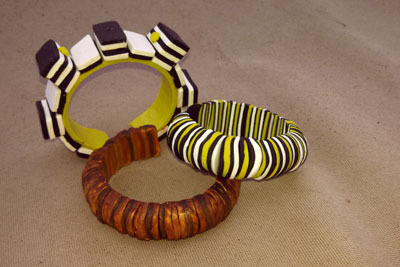 So here are my Monarch (the strips) and Western Tiger Swallowtail bracelets. The Swallowtail is caned, of course, but the Monarch is the one that got me going the rest of the weekend. 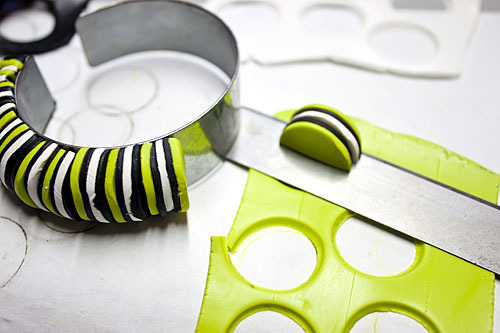 It’s the smallest round cutter in my set of rounds, cut in half and stacked together on the Sculpey bracelet blank. Well that got me thinking. So fun, so fast, what other colors could I do it in. Obviously, any bright combination would work, but what about metallics? What about OTHER cutters? like the Sculpey mini-cutter rectangle? (Possibly my favorite cutter in the world!) I”m not done, I’ve got to experiment with circles and rectangles together…and triangles…and ovals…and flowers, don’t forget half flowers! Do you have any cutters that would work well stacked on the blank like this? 2 Responses to Play Time! Very cool! Love the color combinations!